← Important appeal: Did you know Brian Turley? Looking through old photos and found this one of my mom’s friend with her son Bob and my brother Tony. 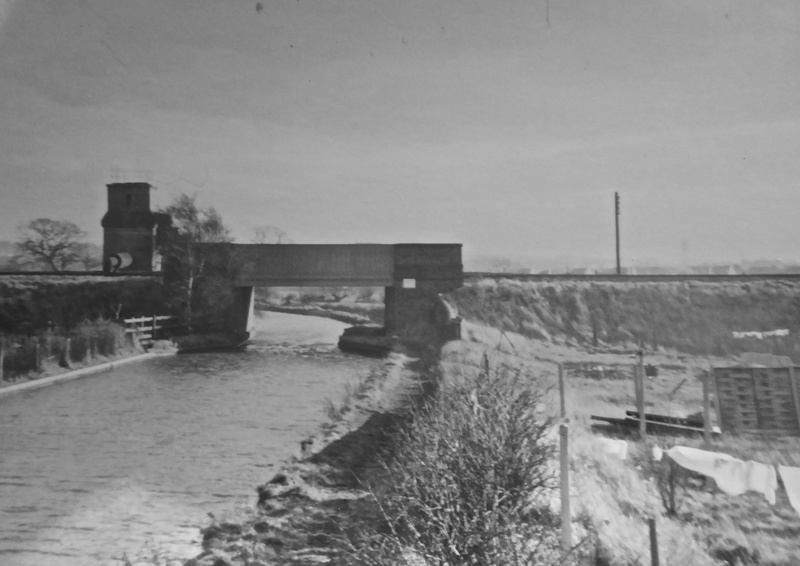 It was taken at the side of Jolly Collier bridge in 1955 and you can see the water tower in the distance off Pelsall Road. We used to take picnics there in the summer, happy memories. Thanks to Patricia – what a wonderful photo! Remember the surge stack, subject of intense debate, and rediscovered thanks to David Moore and Chris Pattison? We established that the 100 foot high chimney-like structure, once present next to the railway embankment by the canal just near to the Pelsall Road in Brownhills, had been truncated at some point. Exactly when this odd landmark was demolished has been the subject of much debate. A shortened surge stack, viewed possibly from the Pelsall Road or embankment nearby. Note the pipe linking it to the main. Image very kindly supplied by Gerald Reece. Gerald Reece posted the above photo of the foreshortened stack still clearly proud of the railway embankment in the post-WW2 period, which I think is in the 1960s, but without a definite date – the the image shows the gardens of what seem to be new houses, and fairly modern fencing. Gerald’s image seems to be later due to the growth of the bush to the right of the stack, and change in telegraph poles. Portion of an image supplied by Patricia Cotton. Just so we know what we’re all taking about, I feature an image of the complete stack from the Clayhanger side of the railway. It was quite something in its day. Thanks to Patricia for another wonderful contribution, and if you have anything to add, please do: either comment here or mail me – BrownhillsBob at Googlemail dot com. Little by little, the history emerges…. This entry was posted in Brownhills stuff, Clayhanger stuff, Environment, Events, Followups, Interesting photos, Local Blogs, Local History, Local media, News, Reader enquiries, Shared media, Shared memories, Spotted whilst browsing the web, Walsall community and tagged 1955, Brownhills, Brownhills local history, Canal, Chris Pattison, Clayhanger, Company, Cotton, Dave Moore, Derelict, Dora, Gerald Reece, Hemming, Jolly Collier, Lichfield, local blogs, Local History, Morturn, New Photos, Old maps, Patricia Cotton, Pedro, Pumping, Rathbone, Reservoir, Sandfields, Shire Oak, South Staffordshire, Staffordshire, Station, surge stack, Things to do, ventilator, Walsall, Water, Water tower, Waterwoks. Bookmark the permalink. Thanks for this post Bob. I think it’s fairly well established now that the stack was truncated c.1932 and completely demolished following the abandonment of the Railway Main in 1971. It would be interesting to know whether there are any remains of the foundations in the brambles which now cover the site. I don’t think I’d seen Gerald Reece’s photo before, thanks for including that too. A further point that interests me is whether the 22 inch main was carried on a pipe bridge over the canal on the same side as the stack. The deck doesn’t look deep enough for it to be conveyed under the railway track. Lovely photo of kids messing around in the cut, just like being at the seaside. Thanks Patricia and Bob. If you wish to read more about the Surge Tower or the pipeline please refer to the follwing articles which may be of help. With regard to the pipe the railway bridge over the canal certainly shows the probable route of the pipe on the south side (Clayhanger) of the line. I haven’t really examined the canal bridge but I would think that a similar arrangement was made. You are quite correct in that the pipe was NOT under the deck of the railway track. I would again like to thank Chris for his assistance in the articles. Finally, I have still to discover an exact date when the bottom section and base of the tower were finally demolished. Ironically, I currently working through the British Rail “Weekly Notices” for 1972-73 so you never know something might turn up!